I love getting requests and this week I was asked for doughnuts, which gave me the perfect opportunity to get all experimental with flavours and designs – bliss! I’ve had a really good quality bottle of maple syrup in the cupboard for a while and it’s been begging me to be used in other ways than poured over waffles (recipe coming soon!) or yogurt, so that had to feature, and a maple syrup glaze sounded rather tempting! Since maple syrup has a mellow sweetness I’ve given the actual doughnuts a subtle spice to give an overall warm cosines – it is still wintery after all, so any warmth and goodness is most welcome. I’m particuarly pleased with this riff on my usual baked doughnut recipe – the flavours work really well and the maple glazed has a wonderful soft bite which is perfect for a doughnut. I was worried that they’d look a little anaemic as the icing is a syrupy tan colour on a golden doughnut, so a sprinkle of adornments definitely adds to the overall look. Mix together the dry ingredients. Combine the wet ingredients and pour into the dry. Gently mix until fully combined. Bake for 7-10 minutes until well risen and a knife comes out clean. Remove from the tins and cool. Whisk together then use to coat the doughnuts and sprinkle with decorations. Little S is off on a school residential trip this week, it’s the longest she’s ever been away from home, and we’ve really been missing her and her amazing positive energy that keeps us all buzzy and upbeat! Also, we’ve obviously been worried about food – the centre were very on the case and reassured me before she went, but you can’t help wondering if she is actually eating anything, or brave enough to trust someone else’s food…. These beauties are proper handful sized doughnuts, spiced with wonderful Speculaas Spice and then filed with smooth Caramelised Lotus Biscoff spread keeping the mellow spiced theme – utter delight! Roll in the sugar whilst still warm. 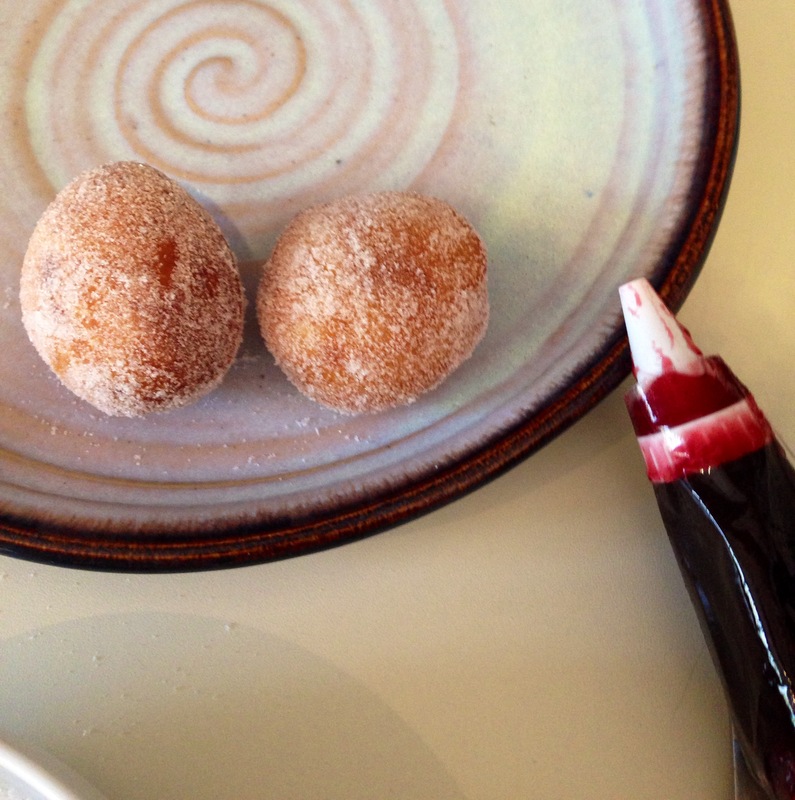 To fill the doughnuts – once cool, make a small hole in one side and pipe in some lotus spread or raspberry jam. Soft baked richly chocolatey doughnuts, smothered in a mirror shiny deeply chocolatey glaze – surely a temptation to anyone? Our house has been riddled with the most awful flu for the last couple of weeks – the girls have had loads of time off school unable to do anything but lie on the sofa and watch TV, and even now we’ve turned the corner to recovery they still don’t have any appetite or much strength. So, as we’ve been stuck in, I’ve been on a mission to cook things they might fancy to eat – things to tempt them to reignite their appetites and regain all that lost strength. We’ve had sweet corn chowder, savoury scones, homemade gingerbread, noodles and potato croquettes – small bites have been had, but nothing has really done the trick to re-fire the appetite. Until now! These doughnuts, with their stunning shiny glaze did the trick – at last, a small amount was wolfed down in seconds! Pour in the milk, melted margarine, aquafaba and essence and mix to form a smooth very runny dough. Sift together the icing sugar and cocoa. Whisk in the milk and essence to form a glossy, smooth icing. Spread on each doughnut and leave to set. Sprinkle with grated white chocolate, mini chocolate chips or sprinkles, if desired. Iced doughnuts are one thing, but sugar coated rings are the stuff of memories and traditions ( well for me anyway!) – it’s those sugar coated rings that are used for traditional party games such as eating doughnuts without licking your lips and without hands when they’re hanging in strings – to me they seem more evocative. I was so happy with the results from by baked doughnuts, that I rushed out and bought a doughnut tin; I just couldn’t resist making more doughnuts and this time in perfect little rings! While this recipe may only be a small riff on the original baked doughnut recipe, I think it’s worth posting – the added cinnamon gives a lovely warmth, but careful don’t add too much or the delicate doughnut taste will be lost forever! Most recipes I’ve come across brush the bake doughnuts with butter (dairy-free in my case, obviously!) before rolling in sugar (has to be caster in my opinion) but I found that gives a greasy feel which I wanted to avoid. So I brushed my doughnuts with a thin water icing of 4 tbsp of water to 1/2 cup icing sugar) and then rolled them in the caster sugar. This gave a lovely, slightly crisp exterior and ensured the sugar to stayed in place. Mix together the water and icing sugar to form a thin icing. Pour the caster sugar and cinnamon (if using) into a shallow bowl. Friday after school always calls for a proper sweet treat. A ‘well done the week’s over and welcome to the weekend’ kind of treat. 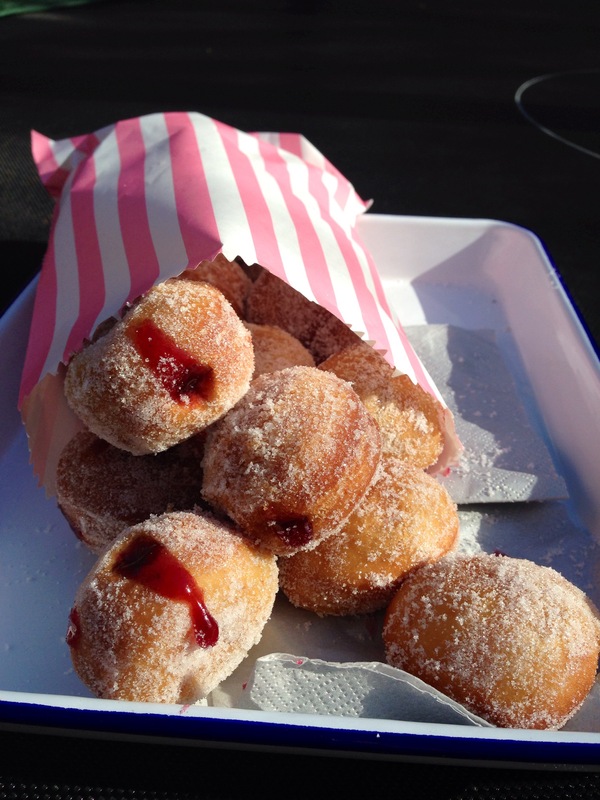 Doughnuts must be the ultimate naughty treat – deep-fried, sugar-coated, jam-filled bites of pure naughtiness, and so totally perfect for welcoming in the weekend! 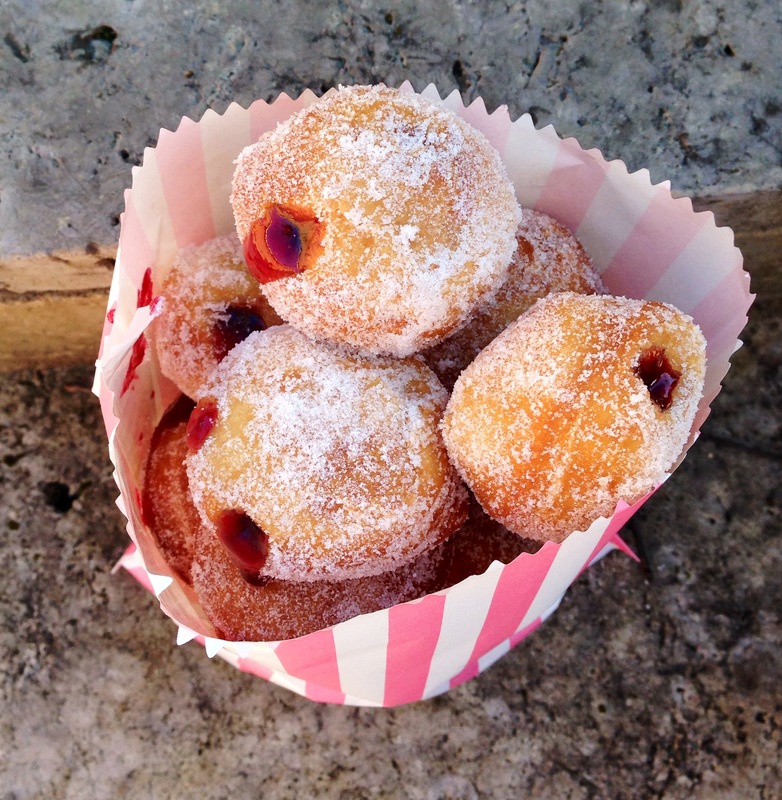 These mini Berliners are filled with blackcurrant jam whereas more traditionally it would be raspberry. – Deep fry 2-3 doughnuts at a time until well browned all over then drain on paper towels. Roll in the sugar whilst still warm. 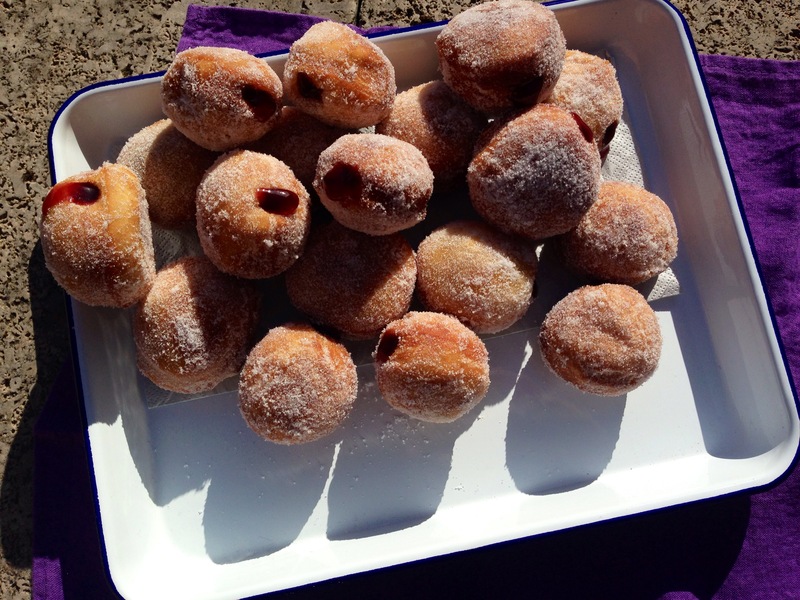 – To fill the jam doughnuts: once cool, make a small hole in one side and pipe in some smooth blackcurrant jam.